This sleek Portable Cosmetic Makeup Trolley has multiple dividers, removable trays and compartments to offer space for your cosmetic brush sets, nail polishes, makeup kits and other beauty accessories. all good, however the trolley handle feels a little flimsy. Great! Item in excellent condition as described. Fast, easy to deal with. Item arrived 1 day late Not sellers fault couriers don't work weekends. well packed and fast delivery a pleasure to deal with thankyou. 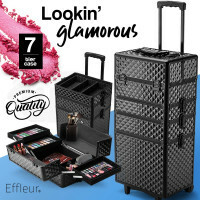 Beauty Case Trolley: Awesome product, would highly recommend to anyone looking for a good quality case at a reasonable price!